The first time I saw the Upper Klamath from atop the ridge, my heart raced. After the hour and a half, gorgeously scenic drive over the Green Springs Mountain from Ashland, I was ready to get on the water. It was my maiden voyage on this stretch of river and I was accompanied by some of the most apt gentlemen I’ve had the fortune of boating with. The put-in at Spring Island is a small ramp with a trip registration box, pit toilets, changing rooms, water gauge, and an eddy where raft crews can knock off any paddling cobwebs before cruising downstream. We rigged the boats, suited up in our dry suits, and praised the sun’s rays that welcomed us to the cold water. As we pushed off from shore and waved farewell to our shuttle driver, I was overcome with a feeling of excited nervousness. I’ve rafted big water and I’ve dodged through technical water, but I had a feeling the Upper Klamath would trump my previous whitewater challenges. I gripped my paddle and dug into the water with the first “forward two!” command from Glen. “This is a commercially guided trip, it can’t be bigger than anything I’ve done privately,” I thought while we navigated through the first few miles of class II and III rapids. This was our warm-up stretch and even here, jagged boulders reared inconspicuously from under the silty water. Right off the bat, the river flushes from one rapid to the next, blurring the lines between exit and entrance, a preview of the continuous flows to come. In the sporadic flat water, the in-boat historian, Erik, briefed Glen and me on the historical relevance of the Klamath River. People have lived in the Klamath Basin for thousands of years. It is likely that inhabitants witnessed the eruption of Mt. Mazama 7,700 years ago. Salmon runs once united the Klamath Basin. The Klamath River tribes — the Yurok, Hupa, Shasta, and Karuk — harvested salmon for sacred ceremonies. The Gold Rush of 1850-51 brought many miners. The miners caused a terrible disruption in the lives of the Native Americans of the area by damming and diverting water for mining purposes, which made it difficult for fish populations. Dam building on the Klamath began in 1908 and by 1962 there were six dams on the river. In 1917, the first public lands were opened and sold for homesteading. Multiple homestead plots can still be seen from the waters edge and explored with the leave no trace mentality. We’re pulled over on river left to scout Caldera, the first large rapid of the day. A 100-yard, class IV+ boulder choked chute with holes everywhere and churning brown water obscures any signs of a clean route. Erik explains the run from memory and we all nod in acknowledgment. When Will asks me if I’m ready, all I can do is raise my eyebrows and let the corners of my lips curl in a tight smile. This rapid is outrageous! And it’s only the beginning. We climb back in the boats, paddle-five, and drop into the torrential water. Paddling with force I wasn’t aware I had, we zig-zag through the rapid, left, right, back to the left, past the mushroom rock, punching through the holes. There is constantly water splattering my face, drenching my glasses and making me wish I had wiper blades on my lenses. My vision is inhibited but I maintain the repetitive paddling action, thankful I’m providing power and not steering. This is a rapid that truly isn’t over until you are in flat water. No time to breathe, I let out a deep sigh when we’re comfortably in the eddy. The Klamath River crosses a plateau formed by volcanic rock and this causes the boulders in the Klamath to be more abrasive and jagged than, say, the rocks in the Rogue River, which have been worn smooth. Because of this, an already complicated rapid morphs into that game that kids play while climbing from couch to couch – the carpet is hot lava and to touch it would be disastrous. Swimming in the Upper Klamath amidst a rapid is simply a bad idea. The incentive to stay in the raft is obvious: the river, raging forward at 80 feet per mile, is a maelstrom of rocks and waves. Because of the mining history of the Klamath Basin, many of the rapids have names reminiscent of the Wild West days. Gunslinger, Branding Iron, Gunsmoke, Ambush, Ol’ Bushwacker, and Pony Express. Who has the quicker draw? The rafter or the river? Before all hell breaks loose, we enter Satan’s Gate: a 150-yard, 90-degree right hand turn with large holes, large waves, and large rocks river left. Satan’s Gate is the first of three rapids that make up Hell’s Corner. The current sweeps into Hell’s Corner Rapid and charges downstream. Hundreds of yards of whitewater lay ahead sprinkled with haystack waves, potential wrap rocks, and sharp turns. Eventually, just as I’ve started to feel confident in my paddling abilities, I take a stab at the oars — my first love when it comes to conducting a raft. Stern frames in steep drops are the catalyst for a “memorable” experience – for the guide. When the raft is vertical in the wave, you’re 14 feet up in the air with no seat belt and the full force of gravity and momentum pulling you down. Next thing I know, I’m face planting on the thwart in front of me and trying to regain my seating before the next drop. In this case, a “get down!” command may be more for the guide than the guests. We cross the Oregon-California state line, the canyon opens up, the river widens and the flow slows. We pass cattle fields and logging claims. I’m gazing at the open blue sky, taking full breaths, and already re-running the rapids in my head. In the distance I can see our take-out and the big white van that delivered us to the put-in. The Upper Klamath is a river frozen in time, with rapids as chaotic as its history and a canyon haunted by past inhabitants. As visitors to this river canyon, we have had the good fortune to experience a slice of a true western gem via pin-balling our way through some of Oregon’s best whitewater. With the boats and gear loaded, we ramble down a dirt road leaving a trail of dust lifting in the air. Off into the sunset and back to Ashland – it’s the perfect closing to a day spent in the Wild West. 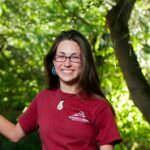 Emily is the office manager for Indigo Creek Outfitters, a rafting, tour and vacation company based in Ashland.